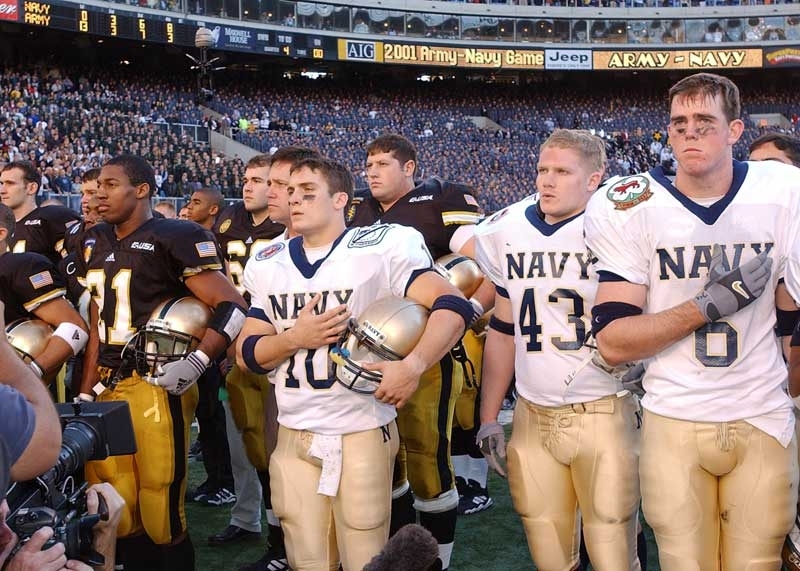 West Point and Naval Academy players stand for Navy's alma mater after the 2001 game. It was the first one played after 9/11. Many of the players went on to serve in Iraq and Afghanistan. Because at this point the NCAA doesn’t deserve the Army-Navy game. The Bowl Championship Series proved again Sunday night to be an absolute fraudulent process highlighted by selecting Virginia Tech and Michigan for the Sugar Bowl. Really, though, this has been such a bad year for college football that the BCS has been the least of its worries. Just ask any Penn State alum. Who would have thought boosters paying for abortions and strippers for players down in Miami would become a side story by season’s end? I’m not here to put the Army-Navy game on an extreme pedestal– I’m sure there are a few skeletons in the closet. There always are when so many corporate sponsors and so much money gets weaved into college athletics. Again, ask a Penn State alum what happens when you place a rivalry, team, or coach on too elite a pedestal. The person or team has trouble living up to expectations. But the Army-Navy game is the closest the NCAA will come. Army-Navy had long been played the first weekend of December, sharing the day with most conferences’ championship games. Officials moved the game to the second weekend in 2009, making it the last regular season game of the year. And rightfully so. The best rivalry in sports deserves its own weekend. Army-Navy week is upon us and what a breath of fresh air it is. The NCAA can keep the Godaddy.com Bowl or the TicketCity Bowl. The bowl season isn’t decided by wins and losses anymore. How many tickets a school can sell is what matters most. Bowl representatives, namely Sugar Bowl representatives, don’t even pretend anymore. Forget the BCS for a weekend. If you read this blog you probably already have. Winning the Army-Navy game means more to these players, students, and alumni than any made up BCS title. Just ask any West Pointer who has had to endure nine straight losses. I’m positive a West Point alum would trade a win over Navy for any Sugar or Fiesta Bowl trophy. Look into the eyes of the players after the game Saturday as each team lines up to listen to both service academies’ alma maters. These kids don’t play for an extra tattoo at the local parlor. They play for their teammates. They play for their school. Most importantly, the players play for their services. The disappointment is pure. And the jubilation is even more sincere. With that, mercifully let Army-Navy Week begin. College football fans need the relief. Well Said Sir. A joyous commentary on a cherished tradition, that transcends the sport it represents. Thank You. These players certainly do play for their teammates. We have guest bloggers all week – the first of which is a former player that speaks exactly to this point. Read what he has to say. and they also play for their fellow Warfighter as part of a Band of Brothers. On Saturday, Dec 10th, they will play their hearts out to add another notch on the record book. BUT, come Sunday they are now Brothers in Arms because they know that after graduation they may well find themselves in the same combat zone covering each other’s 6! Brotherhood doesn’t get any closer than that!!! You are 100% correct that a win against Navy means more than many bowl wins. We used to be competitive and Navy has done a much better job of moving their program forward. For 3+ hours a year, I can’t stand those SOBs. For the rest of the time, I have nothing but the highest respect for them as brothers in arms. Go Army, Beat Navy! A proud tradition that transcends the game of Football. Two institutions which place Honor and Country before Self. Two institutions and students/alumni who have the highest mutual respect. The Best our Nation can field in the stadium, on the field and in the bleachers. Go Navy! Go Army! Go Air Force and Coast Guard too!